Anyone familiar with Ravel's Bolero will instantly recognize the simple musical phrase that is repeated over the entire piece. It begins slowly as a snare drum establishes a military march-like rhythm, joined by a solo woodwind, then a flute, then more instruments are added with every iteration until the entire orchestra is engaged. The piece was written for ballet, is simplistic and highly repetitive, yet as the increasing musical voices repeat the same monotonous refrain, it becomes oddly compelling. The composition was popularized in the movie "10" when Bo Derek declared it as the perfect musical accompaniment for getting screwed. Which, when you think about it, makes the Bolero a perfect analogy for the political process surrounding the federal budget. We also know that cutting annual domestic spending alone won’t be enough to meet our long-term fiscal challenges. That’s what the bipartisan fiscal commission concluded; that’s what I've concluded. And that's why I’m eager to tackle excessive spending wherever we find it -– in domestic spending, but also in defense spending, health care spending, and spending that is embedded in the tax code." The president is absolutely right. Like the family in his example the US has been overspending for a long time. In fact our extended American family is now spending $5 every year for each $3 of revenue we bring in. Anyone with basic arithmetic skills can easily understand this as problematical and unsustainable. Not to mention - batshit insane. The problem is not with what President Obama says. His message is spot on. The problem is with what he does. The problem is that, despite what he says, the budget he is proposing does not reduce spending. He says we need to "live within our means". This budget does not. He says we need to "cut back" on spending. This budget increases spending. Those of us who are familiar with conventional English usage know that increasing spending is the diametric opposite of "cutting back." 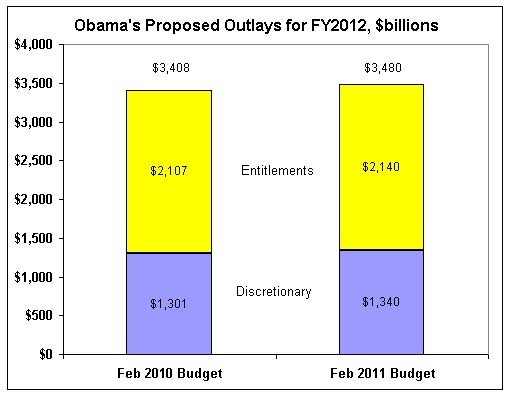 The chart shows Obama's proposed spending for FY2012 from last year's budget, and his proposed spending for the same year from his new budget. His new budget proposes slightly more discretionary and entitlement spending for next year than did his last budget! Obama claimed in his "Budget Message" yesterday that "taking further steps toward reducing our long-term deficit has to be a priority," but looking at his actual budget numbers shows that isn't true." "Actual numbers" can be so annoying. So black and white. So... indifferent to soothing tones or soaring rhetoric. 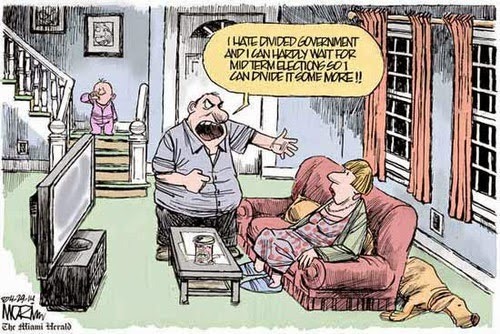 The Dividist is going to cut President Obama some slack here. I assume that this budget is a tactical non-serious opening offer in what the administration expects to be a protracted, knock-down drag-out no-holds-barred steel cage match negotiation with Congress. Given the slings and arrows the President suffered from his left flank attacking his negotiating posture on Obamacare and the lame duck tax compromise, we should expect a different opening gambit now. The administration knows that whatever they put on the table, the need to compromise with the GOP will force deeper cuts into the final budget. So why not start with a budget that makes no cuts whatsoever? It is a good negotiating posture, but the Dividist just can't believe he has the cajones to describe this budget as if it represents any fiscal belt-tightening at all. Even the press corp had a hard time finding anything resembling fiscal responsibility in the proposed budget. This glaring credibility gap between what the President says and does is the defining characteristic of his first term. This budget may be the worst example yet. Remember when President Obama said there would be no more budget gimmicks to hide the real cost of programs and the impact on the deficit? 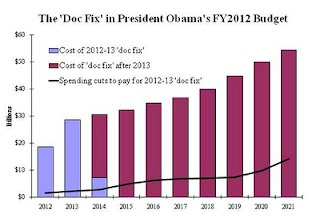 Remember when President Obama claimed that Obamacare will lower costs and reduce the budget? Well, meet the Mother of all Budget Gimmicks, used to disguise the fact that Obamacare is not paid for. Not even close. This is not a credibility gap, this is a credibility Grand Canyon. "Obama's budget includes a two-year, paid for fix. But how it's paid for is pretty worrying: as Cannon's graph shows, the spending is all done in the first two years, but the cuts needed to pay for them take place over 10 years. This is a dog's breakfast. First of all, as I noted yesterday, many of these things are having trouble getting through Congress as it is; and second of all, why on earth would you use this motley grab-bag of long-term pay-fors to cover short term spending? The answer, I suspect, is that the cupboard is bare. They don't have any better revenue mechanisms left--everything that anyone even thought was plausible went into ObamaCare. And yet, they can't simply cut doctor's reimbursements by one fifth. So they scrambled for anything at all--and the only way they could come up with the necessary revenue was to stretch the cuts out over ten years, while covering the spending for only two years. Obviously this is not a sustainable strategy, any more than I can simply pay for an increase in my annual restaurant budget by cutting back on my movie budget for the next ten years--eventually, you've zeroed out the rest of the entertainment budget, and the tab at Komi is still growing. Yet this seems to be the only plan the administration has to pay for the doc fix--a problem that wasn't addressed during health care reform, as far as I can tell, precisely because it was too expensive." 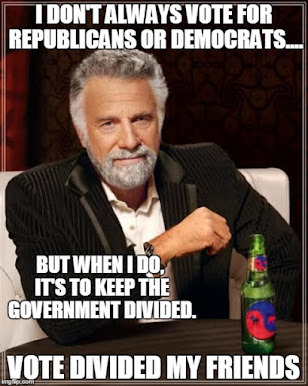 The Dividist would like to see President Obama re-elected, as he distrusts One Party Republican rule even more than he distrust President Obama. But President Obama is not going to get re-elected if he continues to treat American voters like they are complete idiots. He cannot tell us that increased spending is really a spending cut, and that a massive new entitlement program will save money when it will actually cost money and expect to maintain any credibility. If he wants to get reelected he needs to outflank the Republicans on fiscal responsibility by supporting the bipartisan recommendations of the deficit commission he sponsored. If he puts the full weight of the Presidency behind the Simpson-Bowles Plan and pushed it to a floor debate, the American people would put their electoral weight behind him.